A gangmaster has been found guilty of the manslaughter of 21 Chinese cocklers who drowned when caught in dangerously high tides in Lancashire two years ago. 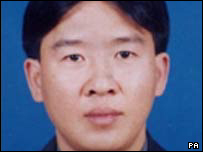 Lin Liang Ren, originally from China, had denied being responsible for the Morecambe Bay deaths in February 2004. He and his Chinese girlfriend and cousin were also convicted at Preston Crown Court of helping cockle pickers to break immigration laws. A father and son from Merseyside were cleared of the immigration charge. During the trial the court heard that 29-year-old Lin Liang Ren was behind a huge operation in which illegal immigrants scoured the beaches for cockles. The prosecution proved it was his criminal negligence which cost the lives of a total of at least 21 Chinese people off Hest Bank. Two other cocklers are thought to have died in the tragedy but their bodies have not been found. They were all illegal immigrants, aged between 18 and 45. Lin Liang Ren, who was based in Liverpool, was also found guilty of facilitation - helping people breach immigration law. His 21-year-old girlfriend Zhao Xiao Qing and 31-year-old cousin Lin Mu Yong, both from Liverpool, were found guilty of the same charge. 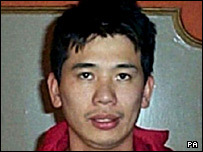 Both Lin Liang Ren and Zhao Xiao Qing were also found guilty of three charges of perverting the course of justice. David Anthony Eden Snr, 62, from Irby, Merseyside, and David Anthony Eden Jnr, 35, from Prenton, Merseyside, were found not guilty of the facilitation offences. After the verdicts were read out, judge Mr Justice Henriques QC said he would sentence the three defendants on Tuesday. All three Chinese could ultimately face deportation, he added. The Edens were accused of running a company which bought cockles harvested by the cocklers. Prosecutors alleged they had therefore indirectly employed the cocklers who died, but the jury rejected the claims and cleared the men of trading with the Chinese cockle gangs. The judge refused applications from the Edens for costs after hearing that Mr Eden Snr lied to police about the importance of cockling to his business. All of the victims were illegal immigrants who had been using false cockle picking permits, forged by Lin Liang Ren and his girlfriend, who was known as Eva. Lin Liang Ren learned the cockle picking business from local cocklers and sold the produce on to fish businesses. He employed up to 70 Chinese illegal immigrants and housed them all in four properties he rented in Kensington, Liverpool. Labour MP for Morecambe and Lunesdale, Geraldine Smith, said she had previously alerted ministers to the number of illegal workers in the town. She thinks the immigration service turned a blind eye. "They were a low priority so they were just left to wander round the country, finding whatever employment they could, and of course that left them wide open to exploitation," she said. After the hearing, Det Supt Mick Gradwell, of Lancashire Police, said the situation the workers had found themselves in was "horrendous". He said: "Listening to some of the phone calls people were making, you can hear the harrowing noises of people as they are trying to save themselves. "It was a particularly horrible and tragic night - a very frightening and horrible way to die." Mr Gradwell said Lin Liang Ren was "callous and despicable", adding that he tried to blame some of those who died for what happened. "The first thing he did was look after himself. There was a cockler who came out of the sea, having saved himself from drowning, freezing cold and Ling Lang Ren told him to get out of the van while he looked after his own welfare." Speaking outside the court, Peter Quinn, solicitor for the Edens, said the decision to prosecute his clients was "a clear mistake" and "an attempt to shift the blame" from the UK Government, the Home Office and the Immigration Service. He said police and government agencies knew what was going on and described it as "an accident waiting to happen".